Hello, I’m so glad you stopped by! So, you’re going on a road trip? I love to travel and have since I was young; but, things change when you travel with kids. The thought of driving anywhere with children in the backseat for any extended period of time can be overwhelming, even for experienced travelers. There’s lots of activity ideas for kids to do in the car all across the web (here’s my car activities for toddlers), but have you made the planning and getting there part easier too? 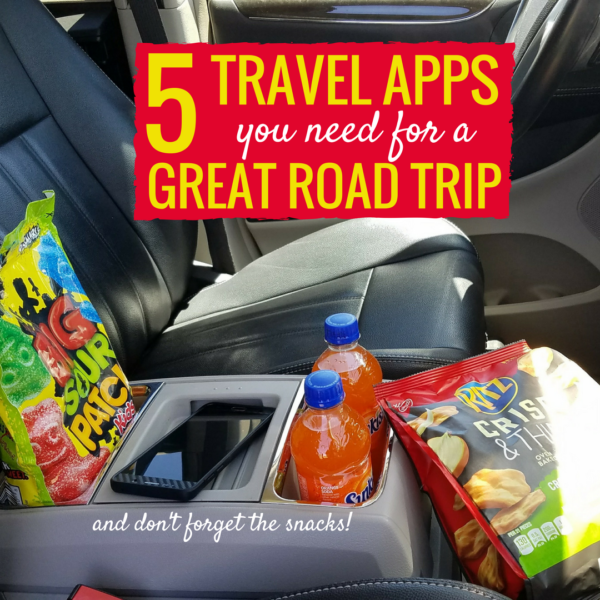 I’ve got 5 travel apps for you to put on your phone to help you get the most out of your next family road trip. Want to share your summer road trips? Check out this Summer Road Trip Giveaway for a chance to win prizes worth over $3,400 in gift card packs! You might be wondering why you need these travel apps or how can some apps help you have a better trip. But, I speak from experience. We are road trip travelers. My boys have never been on a commercial flight in any of their short lives; but, they have countless thousands of miles logged on the highways and byways of the western U.S. Just last summer, we drove over 5000 miles and spent 6 weeks of our 8 week summer break traveling on the road. It was incredible and full of learning experiences. Want to know the biggest thing I learned though? When getting there is part of the fun, the entire trip is more memorable. My boys were so busy having fun, talking about their many adventures, and reliving their favorite parts that they forgot to fight with each other! 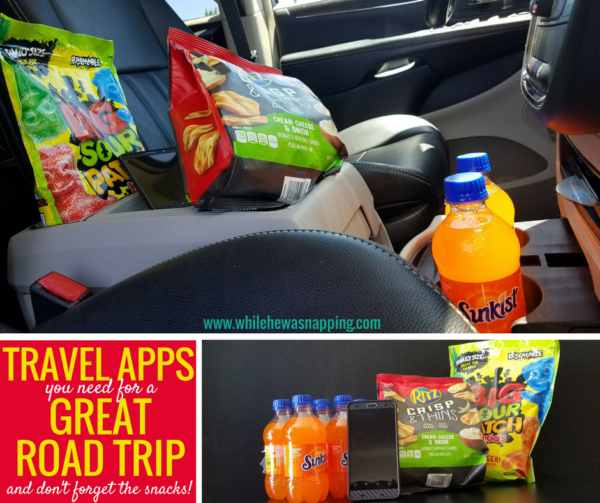 DON’T FORGET THE ROAD TRIP SNACKS! And snacks. In a car full of boys, you gotta have snacks. RITZ is a family favorite in our travel snacks and we love the RITZ Crisp&Thins. They are similar to potato chips, but are oven baked and have 50% less fat per serving than leading regular fried potato chips. My boys favorites are Sour Patch Kids. They usually repeat “Sour. Sweet. Gone.” just about every time they eat some and we love sharing them. But, one of my favorite road trip snacks is Sunkist® Soda. That’s what my dad always drinks on road trips and it’s practically tradition. It’s just not a road trip without some Sunkist® Soda, so I was pretty excited to find the 12oz bottles in an 8 pack at Walmart. They are the perfect size for road trips! 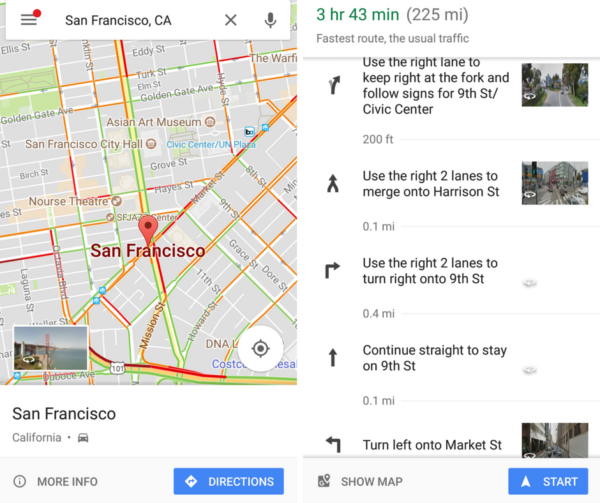 Find your way with reliable maps and turn-by-turn directions. Make fuel stops quickly and efficiently without costing you extra money so your travel budget can go toward having fun! Discover attractions, landmarks, and other areas of interest you might have otherwise driven right past without even a passing glance. Are you ready for a great road trip? Make sure these travel apps are loaded on your phone so you can have the best trip possible. I know how frustrating it is to be in an unfamiliar location and your information is incorrect; however, no app is ever 100% perfect. 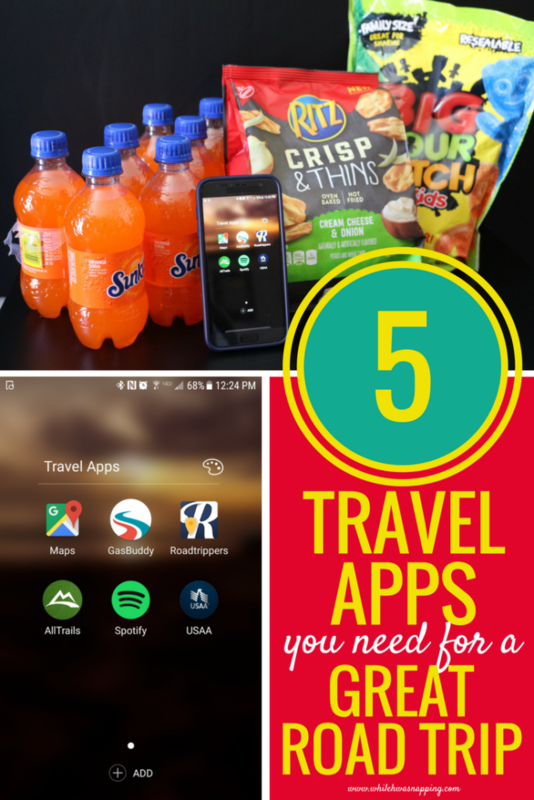 In all of my experience, these are the travel apps I keep coming back to using over and over. Some of these travel apps have mobile websites that occasionally work better than just the app itself; so, if you’re having problems with the app, try the mobile website before you completely write it off. Ready? Let’s go! 1. Google Maps. My go-to app when I’m in a new place or even just trying to get to unfamiliar places in my hometown. Of all the map apps I’ve tried, this one has been the most comprehensive and reliable for me. The turn-by-turn directions are super helpful when there’s kids in the backseat, traffic is unfamiliar and you don’t know where you’re going. Being able to download the maps in case you’ll be going somewhere without cell service is really a nice bonus too. 2. GasBuddy. This is so, so helpful when looking to refuel quickly and get back on the road. There are lots of amazing things to see on a road trip, but I don’t consider gas stations to be one of them. And, as hard as I wish, I don’t have an endless trip budget which makes this travel app an essential for me. 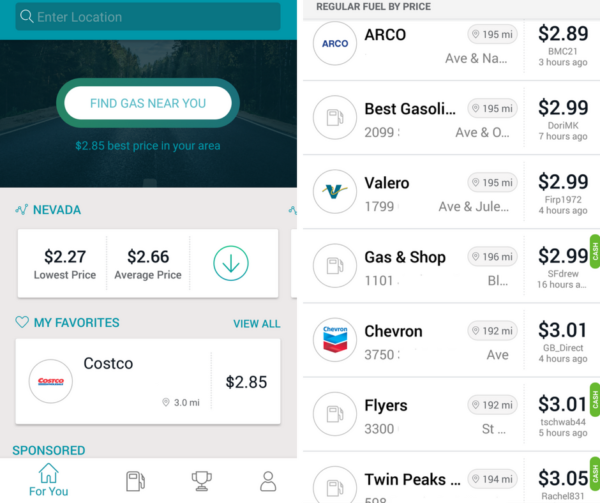 With GasBuddy, it’s easy to quickly find a place to refuel close to the freeway and know that you’re not paying more than necessary so your travel budget can be used for much more fun stops than gas stations. It’s easy to have a passenger look up fueling stations before you get there or use the option to find gas stations near your current location. 3. Roadtrippers. I stumbled across this travel app while I was planning our summer of road tripping last year and I’m so glad I did. Some of the reviews complain about glitches and problems, but I haven’t ever had any issues. However, I don’t use this app for mapping and navigating, only for planning so maybe that’s what makes the difference. 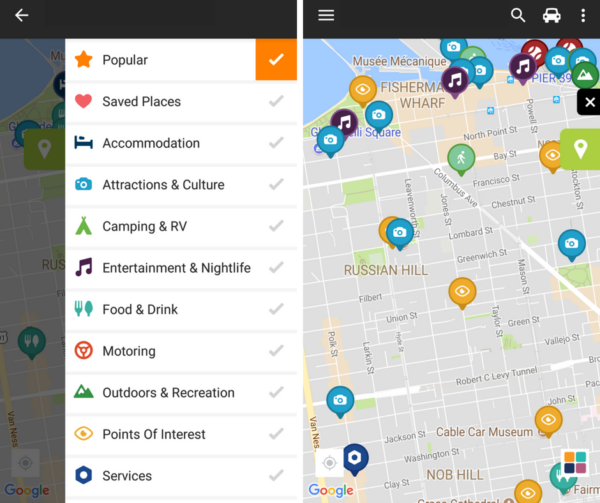 This awesome travel app is like a map of the candy store – it shows you exactly where there are cool things to see, do, eat or even stay. We were able to see some really neat things that we would have driven right past otherwise. Enter your route, choose your desired categories, the distance you’re willing to travel from your route and watch the magic happen. You’ll be presented with your specified points of interest all along your route. You can add them to your trip so you’ll have a list of all the cool places you are interested in seeing and can refer to it along your way. 4. AllTrails. 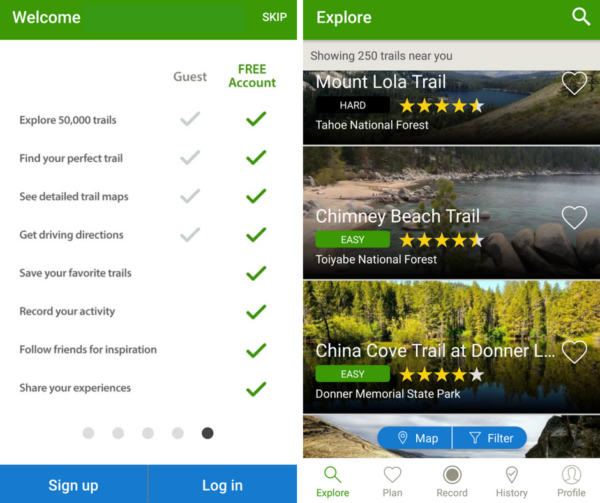 If you love hiking, you have got to install this app. Even if hiking isn’t your thing, download this one while you’re on the road. This is one I was introduced to recently and we have been loving it just for exploring around our area. While traveling this summer, we plan to use it to help the kids run off some energy without stopping at yet another fast food restaurant. AllTrails will show you all the walking paths and hiking trails in your current local area or you can search any area and see what it has to offer. It’s easy to spot the difficulty rating of easy, moderate or hard. You’ll also find a star rating of how much other hikers have enjoyed that trail. You’ll find total distance, elevation increase and whether it’s a loop trail or one you hike in and back out and a brief trail description so you’ll know exactly what you’re getting into before you go. The perfect way to let the kids run off a little energy! 5. Spotify. Or another audio app that will help keep both the driver and passengers engaged. 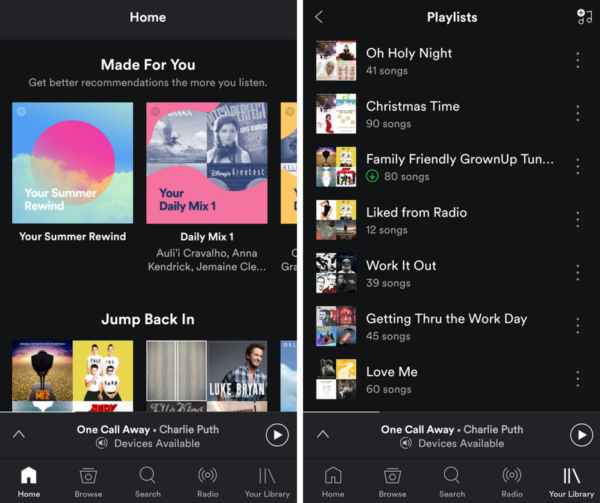 After research, trial and error, and weighing our options we decided Spotify is right for our family. There are lots of great apps out there though. Find something that will engage your family – whether it’s music, audio books, car games or maybe something else. When the seat belts get tight and tempers get short, change the whole mood of the car with your secret weapon – entertainment! WHAT’S YOUR SECRET FOR THE GREATEST ROAD TRIP IN THE WORLD? Do you have travel secrets that make your road trips absolutely amazing? Are you headed out on the open road this summer? We want to hear about it! Don’t forget, you can enter this giveaway for a chance to win over $3,400 in gift card prize packs! What are you waiting for?! Get over there and get your entry in today! 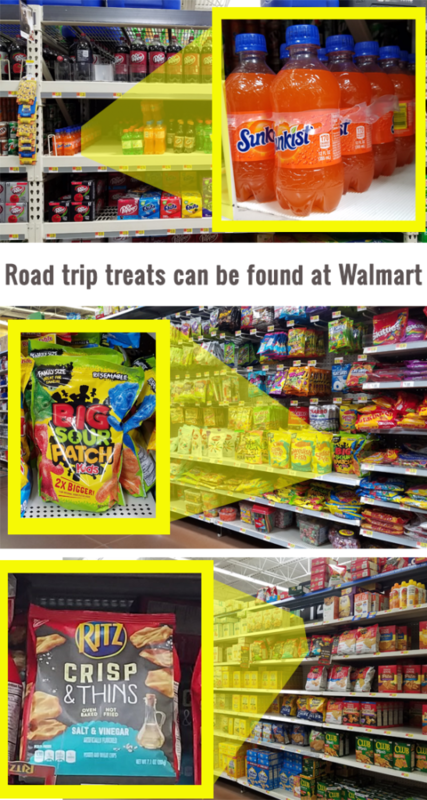 And grab all your road trip treats at Walmart this summer.